The Zelda fanbase never ceases to astound me. After yesterday’s Skyward Sword trailer, which showed off tons of new gameplay footage, environments, and content, there are still all kinds of people finding every reason they can to complain. And while, yes, I realize we here at Zelda Informer can often be the kings of gripe, it’s mostly in fun – we positively adore the series, otherwise we wouldn’t still be here. Now that Zelda‘s silver year is in full swing, it’s time to switch over to our fanhats and raise our Hylian Shields in militant defense of the series. Today’s complaint is about the overuse of Motion Plus “puzzles” in the latest trailer. Apparently there’s a concern that the series is becoming too “puzzle-focused,” with a specific example being the fear that “puzzle-battles” that many feel have plagued the series’ recent bosses are now going to carry over to enemies as well. Essentially the sentiment goes like this: originally Zelda was founded as an action-adventure type game where the difficulty came from the enemies and the environment, not from scripted “puzzles” that you have to perform in order to proceed. Getting through dungeons was usually bogged down by the fact that we kept dying, not that we couldn’t figure out how to progress. In recent years, these fans claim, Zelda games have shifted away from this action-centric approach and made Zelda into more of a puzzle game with some weak action elements. The inclusion of more puzzles has set the series on a downward spiral – and now they believe that Wii Motion Plus is going to make every fight yet another puzzle. I can agree with part of this sentiment: dying is much less of a threat in recent Zelda games. I didn’t even die once in Twilight Princess. In that sense, I suppose you could say that the series has stepped a bit away from its origins. But there are two problems I have with the concerns, and they are that Zelda has always had a lot of puzzles and that the way enemies are constructed in Skyward Sword is a throwback to classic Zelda combat more than it is an infusion of puzzles into the action. Usually the people in the “Zelda didn’t always have puzzles” camp think the trend began with Ocarina of Time. 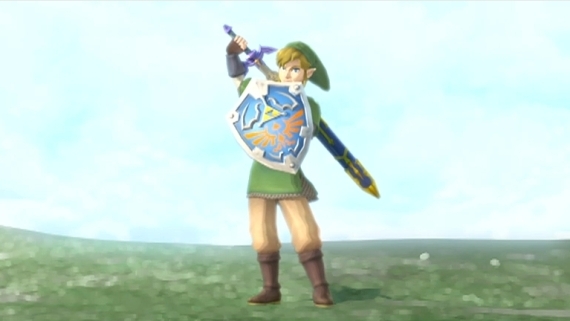 But this is not the case – just look back on the original Legend of Zelda. While it didn’t have very many types of puzzles, almost every dungeon had some kind of scripted obstacle that we had to overcome. Sometimes it was pushing blocks, which you needed to do in most levels to reach the “secret stairs” that led to the dungeon’s hidden item. Block pushing was even more prevalent in the Second Quest, which many hold to be the pinnacle of traditional Zelda action and difficulty. There was an entire dungeon where almost every room had a block to push. Outside of block pushing, there were three main types of puzzles: “burn the tree,” “bomb the wall,” and “play the Whistle” (the Second Quest added a fourth: “walk through the fake wall”). At some point in the game, you needed to perform each one of these tasks in order to access or complete a dungeon, and again the Second Quest used these features even more prevalently. If you wanted to find all of the world’s secrets, you needed to take them even further – you needed to leave no tree unburned and no wall unbombed, and if neither of those solutions worked, try playing the flute! The Legend of Zelda has puzzles just like every other game in the series. I’ve already discussed this with a few people, and a common response I’m getting is “those aren’t really puzzles, they’re secrets.” No, what they are is crappy puzzles that happen to be used as equally crappy secrets. While the fact that stuff is hidden all over the overworld is great, and something I really love about the game, even I can’t deny that actually finding these things is as tedious as the pixel-hints from Other M. Not to mention that half of them are dead-end caves with the Money-Making Game or Pay Me For the Door Repair guy anyway. It’s no surprise that the developers have done everything they can to improve on the series’ puzzles in the games since, because if every game were constructed that way we’d have gotten bored with the series a long time ago. Yes, there’s definitely a big difference between these shallow tasks and the puzzles of the newer games, which often have you searching for items to open the way forward, or lighting a series of torches to open a door, or interacting with other various components of the world using your tools and skills, but these updates didn’t show up overnight. 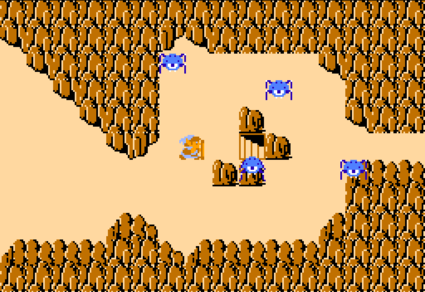 Adventure of Link had you go out and complete fetch quests in order to earn its trademark magic spells, A Link to the Past was actually the first to introduce the torch-lighting trick, and Link’s Awakening featured lots of spots where you were forced to use your tools to manipulate the dungeons. These kinds of puzzles aren’t exactly a newfangled novelty; they’ve been part of the series from the very beginning. The big difference is that they’ve evolved to become more logically- and organically-integrated into the game. As for the enemies, I honestly can’t believe people are complaining about having to slash in a certain direction to fight effectively. In the first place, it’s certainly a vast improvement over the “Z-target, approach, rapidly tap B to win” combat structure of the other 3D games. Heck, most enemies in the 2D games are just as easy take down as well! Giving more enemies the ability to block your attacks and forcing you to use strategy and skill to circumvent their guard sounds like exactly what the series needs to infuse greater difficulty into the battle system. But beyond that, aren’t such enemies staples of the series, too? Think about the Darknuts from the first game, which you had to stab from the side or in the rear. And what about the Iron Knuckles of Zelda II, which adjusted their shields high and low and forced you to aim your attacks around them? Link’s Awakening introduced enemies with swords that could parry your blows if you didn’t properly direct your hits. Ocarina of Time had Stalfos that held up their shields most of the time but were vulnerable when they dropped their guard or tried to attack you. These were among the most challenging and memorable enemies of the older games, the one that kept us busting our fingers and burning through lives until we figured out a good rhythm for defeating them, and there’s no reason to believe that Skyward Sword‘s enemies will be any different. If these block-happy baddies weren’t considered “puzzles” back then, why are these fans accusing this new twist on the idea of being a “puzzle” now? In the end, though, I think these fans are really the odd ones out. The customers have spoken, and based on the fact that all of the 3D and DS Zelda games have outsold their traditional 2D contemporaries1 (and this despite the GameBoy having a much bigger install base), it’s clear that most Zelda fans prefer the new to the old anyway, and are endlessly excited for the possibilities Skyward Sword offers. I’m proud to say that, for the most part at least, I stand among them. But opinions are opinions, and if people really want to think badly of the game based on what they’ve seen, they’re more than welcome – as long as they don’t ruin things for the rest of us. To me, though, this looks like another case of Zelda Fans Hate Zelda.